On Tuesday night, the WWE brought some more holiday cheer to fans as John Cena, Roman Reigns, and other superstars were part of a live show at NYC’s Madison Square Garden. Fans saw a variety of matches during the evening including a steel cage match for the WWE Raw tag team titles, and a six-woman tag team match featuring Paige’s “Absolution” stable. However, the match that seemed to draw the most attention of the night was the main event featuring John Cena taking on Reigns for the WWE Intercontinental Championship. Based on crowd response, the finale of the night didn’t disappoint the fans in attendance. In the recent WWE MSG show results reported by ProWrestling, it’s noted that a total of nine matches were on the big card last night. In one of the matches, “Woken” Matt Hardy defeated Bray Wyatt, while another featured the team of Paige, Mandy Rose, and Sonya Deville defeating Sasha Banks, Bayley, and Mickie James. There was also a WWE Cruiserweight Championship match with Enzo retaining against Kalisto and a match involving Samoa Joe against Finn Balor. In that match, Joe was victorious after he managed to put the Coquina Clutch on Balor and the referee called for the bell. The main event featured Roman Reigns and John Cena going face-to-face in the ring again. The two previously battled at No Mercy 2017 several months ago with Reigns winning a hard-fought matchup. This time around, he was defending the WWE Intercontinental Championship that he won several weeks ago from The Miz. In their latest match, it was reported that Cena received a huge amount of cheering from the MSG crowd and in general, there was a good bit of cheering for both stars. As noted in the report, it was even tough to tell if fans were mostly booing or cheering for Reigns. At the end of the match, Roman Reigns picked up the win to retain his championship. 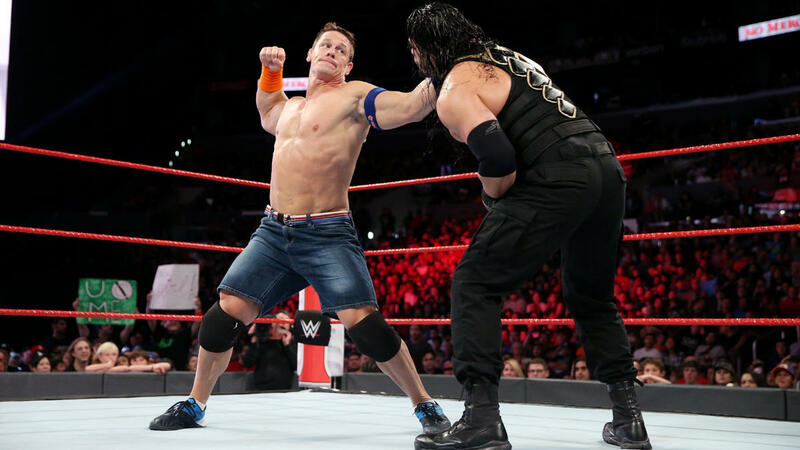 As a fan’s Twitter video shows, John Cena managed to pick Reigns up for the Attitude Adjustment, but Reigns escaped from the move. From there, the current champion was able to quickly connect with his Spear finisher to collect a pinfall win. With that, the crowd was treated to a high-profile match in MSG and Reigns left still the WWE Intercontinental Champion. This may have been a preview of another future battle between the two top WWE superstars today. As of this report, it’s unknown if either John Cena or Roman Reigns will be official participants in the Royal Rumble match next month, but most fans are expecting it. It’s always possible that these two will cross paths once again as the final moments of the Rumble match play out in Philadelphia, Pennsylvania.